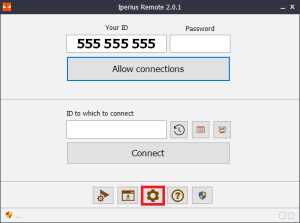 Iperius Remote is an efficient and easy-to-use remote control and support software, with which you can quickly access to any computer connected to the internet. 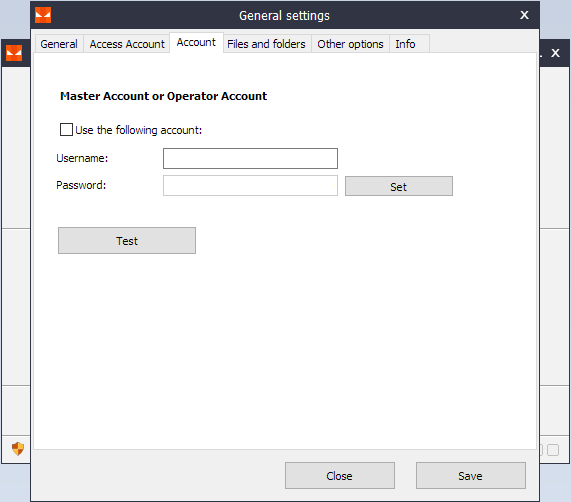 In the latest 2.0 version we have implemented, in addition to several improvements in the stability of the software, a completely revised contact list and a new users/operators system that will allow to separate the remote sessions by grouping them by operator and viewing statistics in detail for each of them. 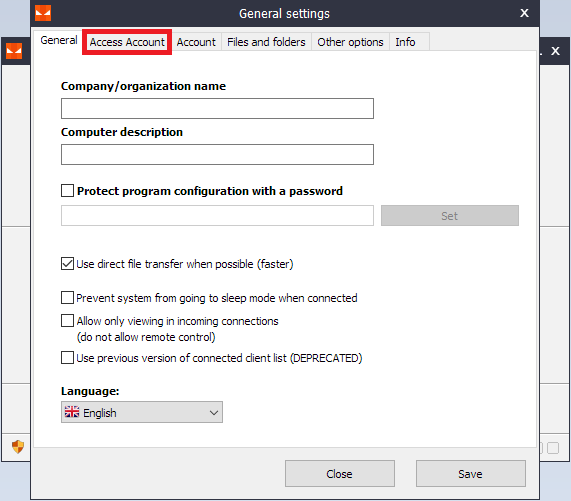 - the Master Account, needed to access to the contact list, as well as to all the management and organization activities of the license itself (creation and editing of operators, display of the statistics, etc.) : you have to put it inside those computers from which you are connecting to provide an assistance. 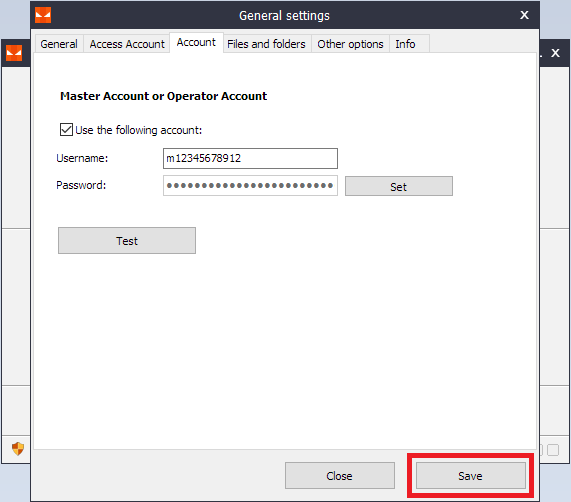 As an alternative, to take full advantage of the new users/operators system, you can directly insert your operator credentials. 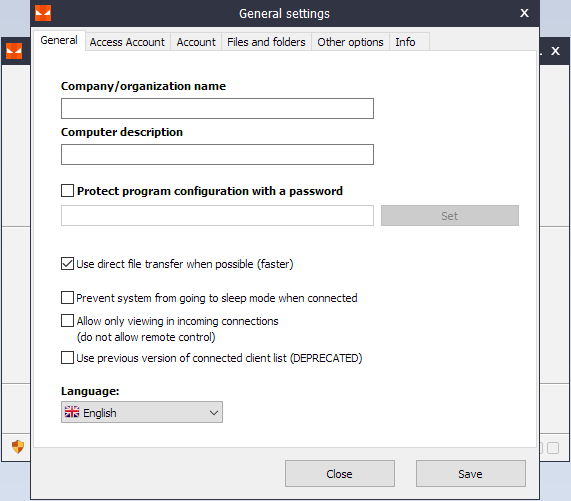 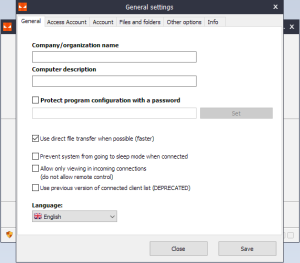 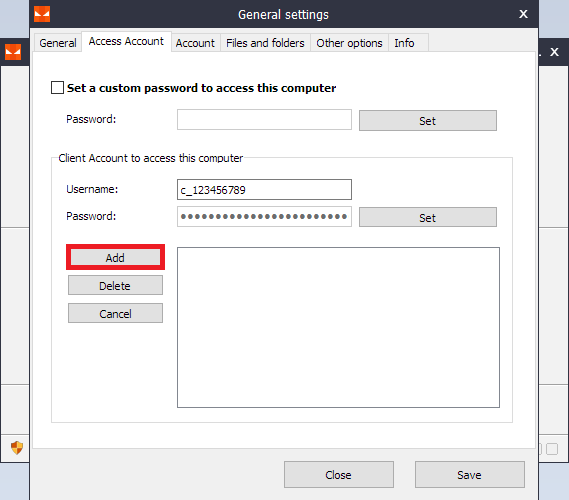 Both of them consist of a username and a password (editable) and must be set inside the “General Settings” menu of the software. 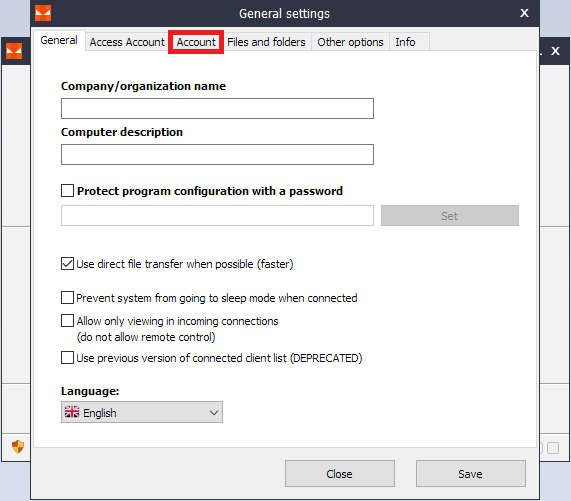 Let’s now see how to correctly configure the two accounts provided after purchasing the license. The display will change to a very simple window (see picture below) where you’ll just have to check the option “Use the following account” and insert your credentials, be they a Master Account or an operator account created inside the Administration panel. 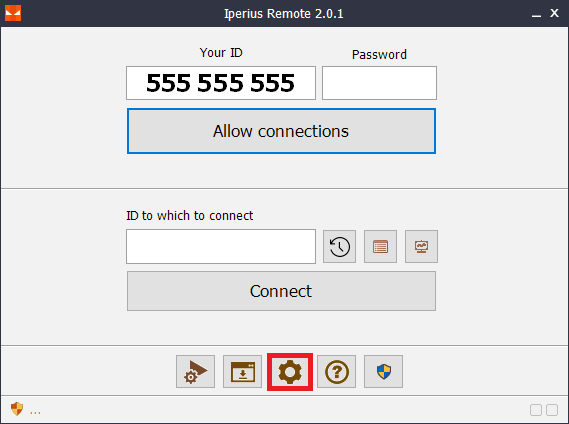 Using credentials, Iperius Remote will be able to logon and load contact list, users and all statistics associated to that account. 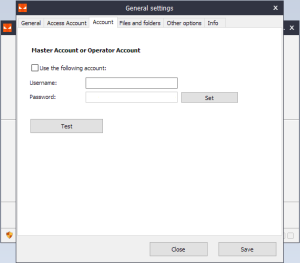 NB: Using the Master account to login is equivalent to login as the “default” administrator of the Iperius Remote license, so both the Administration panel and the statistics of all users will be available by clicking on the appropriate icons on the software main window. At this point, you will be able to access your contact list and, in case of an “Administrator” account or the Master Account itself, also the Statistics and the Administration panel will be available. 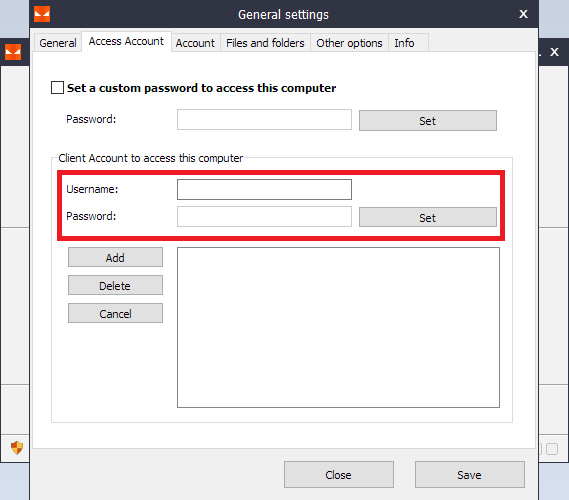 This will open up a window (see picture below) where you can set multiple client accounts, in addition to an eventual custom password to access the PC. 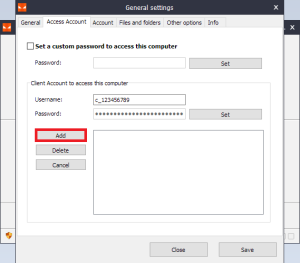 After inserting the credentials of the client account, let’s click on the “Add” button to add it to the “Access Accounts” list below. 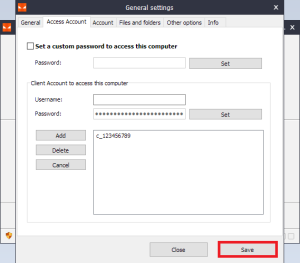 The Client account just configured will be added to the list straightaway. Let’s now click on the “Save” button below (see following screenshot) to apply and save changes and make sure that your PC will be added to the contact list of that Iperius Remote license.